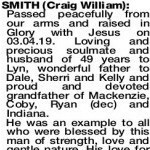 SMITH CRAIG WILLIAM Passed peacefully from our arms and raised in Glory with Jesus on 03.04.19. 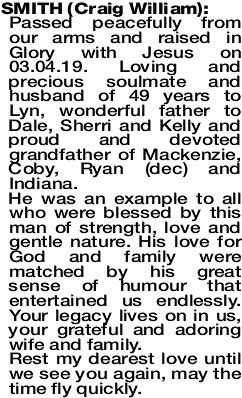 Loving and precious soulmate and husband of 49 years to Lyn, wonderful father to Dale, Sherri and Kelly and proud and devoted grandfather of Mackenzie, Coby, Ryan (dec) and Indiana. He was an example to all who were blessed by this man of strength, love and gentle nature. His love for God and family were matched by his great sense of humour that entertained us endlessly. Your legacy lives on in us, your grateful and adoring wife and family. Rest my dearest love until we see you again, may the time fly quickly. 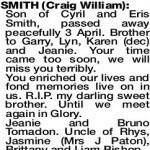 SMITH CRAIG WILLIAM Son of Cyril and Eris Smith, passed away peacefully 3 April. Brother to Garry, Lyn, Karen (dec) and Jeanie. Your time came too soon, we will miss you terribly. You enriched our lives and fond memories live on in us. R.I.P. my darling sweet brother. 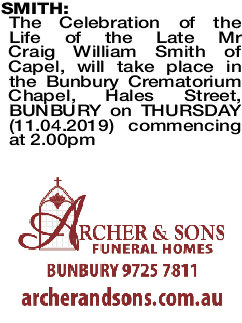 Until we meet again in Glory. Jeanie and Bruno Tomadon. 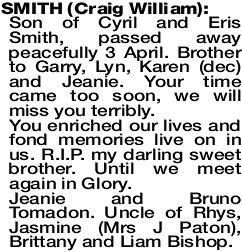 Uncle of Rhys, Jasmine (Mrs J Paton), Brittany and Liam Bishop.